The perfect balance of sporty and fashionable, the Bella+Canvas 3200 baseball t-shirt is a favorite among both men and women. Made with unisex sizing, this 3.6 oz sleeve tee is available in 52% combed ringspun cotton and 48% polyester, as well as tri-blend marble colors too. 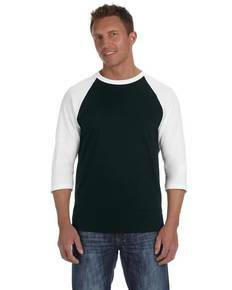 With striking contrast raglan sleeves & neck trim, side-seams for added structure, and a signature retail-fit, this is the go-to option for sleeved men’s and women’s baseball tees. Perfect for your neighborhood kickball team or a trendy new standalone look, pick up your Bella+Canvas 3200 baseball t-shirts today!